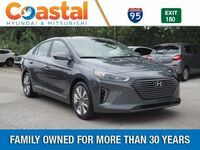 With the 2018 Hyundai Ioniq Hybrid, you can enjoy a fuel-efficient lifestyle without sacrificing anything. It has so much storage that it’s classified as a large car, complete with 60/40-split folding rear seats. Thanks to the high-capacity battery and 6-speed EcoShift® Dual Clutch Transmission with SHIFTRONIC®, you can drive faster, smoother, and farther. Plus, it comes with plenty of innovative features, like Proximity Key Entry with push-button start and Apple CarPlay™ and Android Auto™. 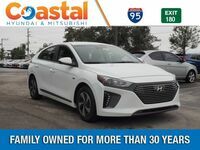 Check out the Ioniq Hybrid Blue, SEL and Limited trims at Coastal Hyundai in Palm Bay, FL. Want to learn more about the 2018 Hyundai Ioniq Hybrid? Reach out to Coastal Hyundai, your local Brevard County Hyundai dealer. We serve drivers from Palm Bay, Melbourne, Viera, Rockledge, and beyond.